Christian Socialism began as a movement in the mid-19th century, around the year 1848. For early Victorian society, religion played a key part in their daily lives, whether it was to help navigate the seasons of the year and help with crop rotation in a rural setting or as an aspect of the daily life of an industrialist in the cities. Christians to be active in society. Duty to help men (and women) out of poverty. It is interesting to note that the actual Christian Socialist Movement collapsed in 1854 as an individual institution as people went their separate ways in the search for a fulfilment of their own political and religious ideals. The emergence of non-conformist religion such as Methodism had a lot to do with the origins of the Labour movement. Early Methodism inspired many 19th century trade unionist movements. In many ways the beginnings of the Christian Socialist movement can be seen to translate into the modern day Labour Party with its support of the political order, its opposition to strike action and its rejection of class conflict. What’s more, many of the founders of what is now the Labour party were Christian socialists, such as Keir Hardie, who had been a lay preacher as a member of the United Secession Church. Many would be surprised to learn that the origins of the left wing party were Methodist rather than Marxist. However many recent Labour leaders, notably Tony Benn, Gordon Brown and Tony Blair, have been committed to Christian Socialism. Christian Socialists find inspiration through Bible passages such as: “Blessed are you who are poor, for yours is the kingdom of God’’ (Luke 6:20). This approach tends not to be revolutionary; rather it calls for improved conditions for the poor rather than radical societal change. Christian socialist ideology has moved popular religious movements and impacted the political landscape in Britain. The Christian and Politics highlights the demand for effective Christian leadership. The opening paragraph of the booklet states that the Church has, for the past 100 years (1848-1948) been ‘urging Christians to take a more lively interest in politics and a more active part in national and international affairs.’ Many Christians of this time, the author notes, do not take into consideration their fellow men in relation to their religion, but rather between themselves and God alone. The author continues to encourage the readers; by identifying the ‘appalling apathy, indifference, ignorance and opposition amongst members of the churches’ and how ‘those who wield political power sometimes use it for selfish ends.’ In addition to this he proposes that it’s up to Christians to speak out the truth of God within the political world in order to work towards something greater. Today the Christian Socialism movement has re-branded as Christians on the Left. It is still an active movement with around 1500 members including 40 MPs. The group today still advocates many of the same principles and actions indicated in the 1948 pamphlet. For example, they believe that in political terms they do not have the “option to opt out,” and must instead be active as Christians in the political realm by taking part in campaigning, standing for election to local, regional, national and European bodies, political theology and parliamentary events amongst other things. 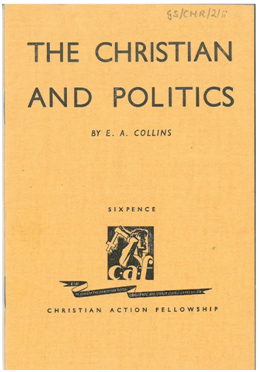 However, although political action is at the heart of the Christian Socialism movement, both in 1948 and today, they are still keen to establish that their “primary identity is in Christ, not a political ideology.” It is therefore in their reading of scripture that they find both the justification and structure for their political activity. 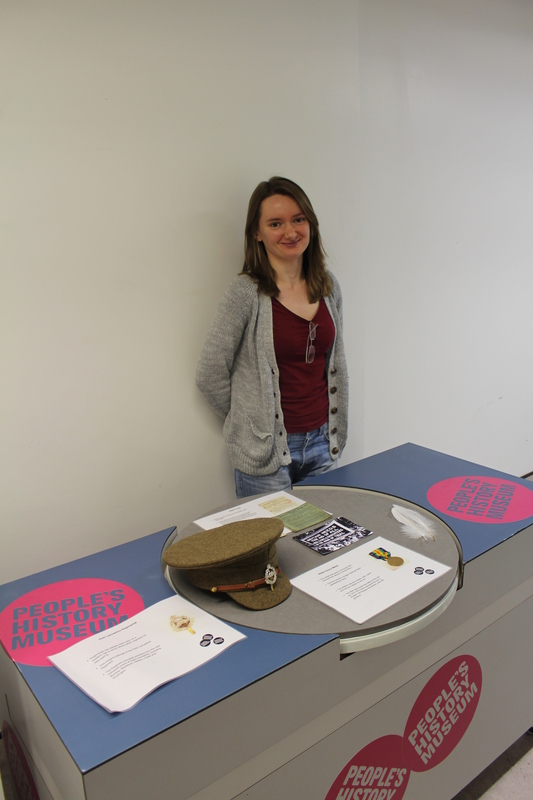 A guest post by placement student Victoria Clarke. Last month marked the start of a new exhibition here at PHM, in anticipation of the upcoming general election. Election! Britain Votes contains several spaces for our visitors to share their experiences, ideas, and creative flair. The responses we collected for the ‘Share Your Voting Memories’ ballot box range far and wide from the young to the old, the joyous to the apathetic. While voting in local and general elections is only allowed by those aged 18 and up, several visitors recounted childhood memories of elections and voting. From watching the results on television, to accompanying a voter, to participating in school council elections, early experiences of elections clearly have staying power. The most resounding result from the ballots is the significance with which people treat it – rejecting the idea of apathy regarding the upcoming elections. Memories shared with us of being a first time voter are joyous and solemn in the understanding that they are able to exercise a degree of choice in the governing of the country, and the changes it can make to their lives. While reading the results, I was struck by one ballot paper which particularly resonated with me –having been a few months too young to vote in the 2010 election, this year will also be my first chance to vote in a general election. According to a study published by the House of Commons on general election statistics since 1964, in the 2010 election only 51% of eligible young people aged 18-24 cast their vote, in comparison with 75% of those aged over 65 (Aliyah Dar, 2013). It is refreshing to see a member of the young electorate dispel the myth that young people do not care to vote. The Election! Britain Votes exhibition marks the present day in the centuries-long struggle for human suffrage in Britain. 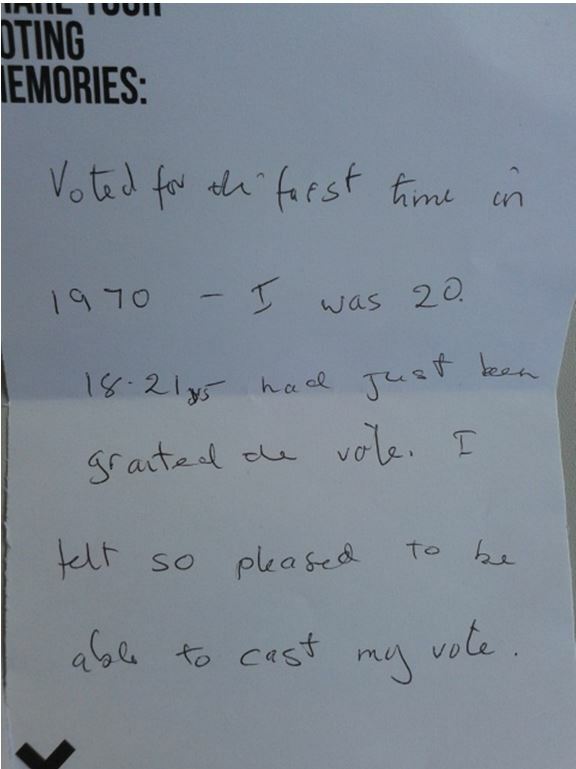 Please continue to share your memories of voting – whether you have voted or not. Conservation of a Garter banner from Hatfield House in Hertfordshire has just begun in the Textile Conservation Studio. The 2nd Marquess of Salisbury was made Knight of the Garter in 1842 and the banner to mark this honour dates from c1847. The banner is similar in size and construction to military colours of the time, being made of a single layer of fine silk fabric, fringed around the edges and hand painted with various devices. Processing of the silk fabric during manufacture to create a good white background for the design has most probably been the catalyst for deterioration of the fabric. The banner is now extremely fragile causing the silk of unpainted areas to spilt and fall away and for painted sections to stiffen and break into angular fragments. 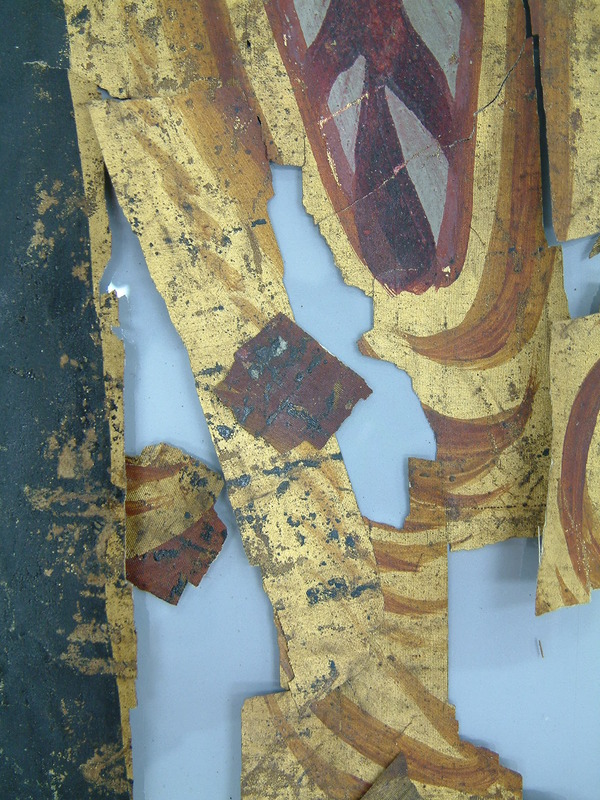 Some loss of white background silk and painted design has occurred, but many detached fragments have slipped beneath adjacent sections and will be retrieved during treatment for correct repositioning. 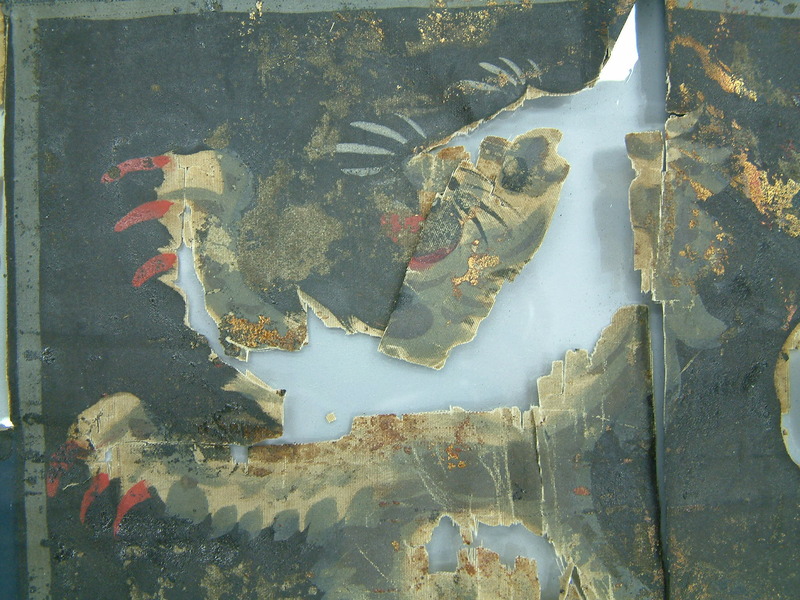 The banner is currently undergoing close examination and very light surface cleaning, allowing recovery of stray detached fragments and testing for further treatment options.